↑ 1.0 1.1 "2006 FIFA World Cup broadcast wider, longer and farther than ever before". FIFA.com. ফিফা. http://www.fifa.com/aboutfifa/organisation/marketing/news/newsid=111247/index.html। আহৰণ কৰা হৈছে: ১১ অক্টোবৰ ২০১১. ↑ "British PM backs return of Home Nations championship". Agence France-Presse. http://www.soccerway.com/news/2007/November/22/british-pm-backs-return-of-home-nations-championship। আহৰণ কৰা হৈছে: December 16 2007. ↑ 'The First World Cup'. The Sir Thomas Lipton Trophy. Shrewsbury and Atcham Borough Council (10 October 2003). Retrieved on April 11, 2006. ↑ "History of FIFA – More associations follow". FIFA.com. Fédération Internationale de Football Association. http://www.fifa.com/classicfootball/history/fifa/historyfifa3.html। আহৰণ কৰা হৈছে: 19 November 2007. ↑ Reyes, Macario (18 October 1999). "VII. Olympiad Antwerp 1920 Football Tournament". rec.sport.soccer Statistics Foundation. http://www.rsssf.com/tableso/ol1920f-det.html। আহৰণ কৰা হৈছে: 10 June 2006. ↑ "History of FIFA – The first FIFA World Cup". FIFA.com. Fédération Internationale de Football Association. 19 November 2007. http://www.fifa.com/classicfootball/history/fifa/historyfifa4.html. ↑ Molinaro, John F. "Lucien Laurent: The World Cup's First Goal Scorer". CBC. Archived from the original on 24 Jun 2006. http://web.archive.org/web/20060624130233/http://www.cbc.ca/sports/worldcup2006/history/events/laurent_lucien.html। আহৰণ কৰা হৈছে: 6 May 2007. ↑ "FIFA World Cup Origin" (PDF). FIFA.com. Fédération Internationale de Football Association. http://www.fifa.com/mm/document/fifafacts/mcwc/ip-201_02e_fwc-origin_8816.pdf। আহৰণ কৰা হৈছে: 19 November 2007. ↑ "The Olympic Odyssey so far... (Part 1: 1908–1964)". FIFA.com. Fédération Internationale de Football Association. http://www.fifa.com/tournaments/archive/tournament=512/edition=8229/news/newsid=92851.html। আহৰণ কৰা হৈছে: 8 January 2008. ↑ "Los datos más curiosos de la Fiesta del Fútbol - Brasil 1950 [The most curious of the Festival of Football - Brazil 1950]" (Spanish ভাষাত). cristal.com. http://www.cristal.com.pe/articulo/los-datos-mas-curiosos-de-la-fiesta-del-futbol-brasil-1950। আহৰণ কৰা হৈছে: ‎17 ‎April ‎2012. ↑ "Scotland and the 1950 World Cup". BBC. http://www.bbc.co.uk/scotland/sportscotland/asportingnation/article/0001/index.shtml। আহৰণ কৰা হৈছে: 13 May 2007. ↑ "Record number of 204 teams enter preliminary competition". FIFA.com. Fédération Internationale de Football Association. Archived from the original on 17 November 2007. http://web.archive.org/web/20071117123621/http://www.fifa.com/worldcup/organisation/media/newsid=122766.html। আহৰণ কৰা হৈছে: 19 November 2007. ↑ "Regulations Men's Olympic Football Tournament 2008" (PDF). FIFA.com. Fédération Internationale de Football Association. http://www.fifa.com/mm/document/tournament/competition/regulations_olympics_beijing_2008_en_6198.pdf। আহৰণ কৰা হৈছে: 22 December 2007. ↑ "Jules Rimet Trophy". FIFA.com. Fédération Internationale de Football Association. http://www.fifa.com/classicfootball/history/worldcup/julesrimettrophy.html। আহৰণ কৰা হৈছে: 19 November 2007. ↑ "FIFA World Cup Trophy". FIFA.com. Fédération Internationale de Football Association. http://www.fifa.com/classicfootball/history/worldcup/trophies.html। আহৰণ কৰা হৈছে: 19 November 2007. ↑ "FIFA Assets – Trophy". FIFA.com. Fédération Internationale de Football Association. Archived from the original on 4 November 2007. http://web.archive.org/web/20071104165903/http://www.fifa.com/aboutfifa/marketingtv/marketing/fifaassets/trophy.html। আহৰণ কৰা হৈছে: 19 November 2007. ↑ "122 forgotten heroes get World Cup medals". ESPNSoccernet.com (ESPN). 25 November 2007. http://soccernet.espn.go.com/news/story?id=484715&cc=4716. ↑ "FIFA World Cup qualifying: Treasure-trove of the weird and wonderful". FIFA. http://www.fifa.com/worldcup/preliminarydraw/news/newsid=576440.html। আহৰণ কৰা হৈছে: 23 December 2007. ↑ "2010 World Cup Qualifying". ESPNSoccernet.com (ESPN). 26 November 2009. http://soccernet.espn.go.com/print?id=468907&type=story&cc=। আহৰণ কৰা হৈছে: 23 December 2009. ↑ "History of the FIFA World Cup Preliminary Competition (by year)" (PDF). FIFA.com. 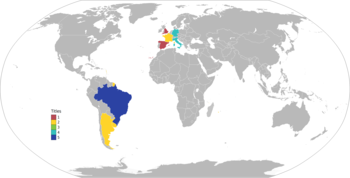 Fédération Internationale de Football Association. http://www.fifa.com/mm/document/fifafacts/mencompwc/51/97/75/fs-201_19a_fwc-prel-history.pdf. ↑ 32.0 32.1 "Formats of the FIFA World Cup final competitions 1930–2010" (PDF). FIFA.com. Fédération Internationale de Football Association. http://www.fifa.com/mm/document/fifafacts/mcwc/ip-201_04e_fwc_formats_slots_8821.pdf। আহৰণ কৰা হৈছে: 1 January 2008. ↑ "FIFA World Cup: seeded teams 1930–2010" (PDF). FIFA.com. Fédération Internationale de Football Association. http://www.fifa.com/mm/document/fifafacts/mencompwc/82/40/89/fs-201_12a_fwc-seededteams.pdf. ↑ "Regulations of the 2010 FIFA World Cup" (PDF). FIFA.com. Fédération Internationale de Football Association. p. 41. http://www.fifa.com/mm/document/tournament/competition/fifa%5fwc%5fsouth%5fafrica%5f2010%5fregulations%5fen%5f14123.pdf। আহৰণ কৰা হৈছে: 21 June 2010. ↑ "Uruguay 1930". BBC Sport. 11 April 2002. http://news.bbc.co.uk/sport3/worldcup2002/hi/history/newsid_1632000/1632201.stm। আহৰণ কৰা হৈছে: 13 May 2006. ↑ "France 1938". BBC Sport. 17 April 2002. http://news.bbc.co.uk/sport3/worldcup2002/hi/history/newsid_1632000/1632206.stm। আহৰণ কৰা হৈছে: 13 May 2006. ↑ "Asia takes World Cup center stage". CNN. 3 June 2002. http://sportsillustrated.cnn.com/soccer/world/2002/world_cup/news/2002/06/03/au_asia_rb/। আহৰণ কৰা হৈছে: 1 January 2008. ↑ "Brazil will stage 2014 World Cup". BBC Sport. 10 October 2007. http://news.bbc.co.uk/sport1/hi/football/internationals/7068848.stm। আহৰণ কৰা হৈছে: 1 January 2008. ↑ "Rotation ends in 2018". FIFA.com. Fédération Internationale de Football Association. Archived from the original on 1 November 2007. http://web.archive.org/web/20071101002817/http://www.fifa.com/aboutfifa/federation/administration/releases/newsid=625122.html। আহৰণ কৰা হৈছে: 10 October 2007. ↑ "Socceroos face major challenge: Hiddink". ABC Sport. 10 December 2005. Archived from the original on 30 April 2006. http://web.archive.org/web/20060430001531/http://www.abc.net.au/sport/content/200512/s1528128.htm। আহৰণ কৰা হৈছে: 13 May 2006. ↑ "FIFA Assets – Mascots". FIFA.com. Fédération Internationale de Football Association. Archived from the original on 4 November 2007. http://web.archive.org/web/20071104232128/http://fifa.com/aboutfifa/marketingtv/marketing/fifaassets/mascots.html। আহৰণ কৰা হৈছে: 19 November 2007. ↑ "1930 FIFA World Cup". FIFA.com. Fédération Internationale de Football Association. http://www.fifa.com/worldcup/archive/edition=1/index.html। আহৰণ কৰা হৈছে: 5 March 2009. ↑ "1950 FIFA World Cup". FIFA.com. Fédération Internationale de Football Association. http://www.fifa.com/worldcup/archive/edition=7/overview.html। আহৰণ কৰা হৈছে: 5 March 2009. ↑ "FIFA World Cup Finals since 1930" (PDF). FIFA.com. Fédération Internationale de Football Association. http://www.fifa.com/mm/document/fifafacts/mcwc/ip-301_09a_wc-finals_alltime_8864.pdf। আহৰণ কৰা হৈছে: 5 March 2009. ↑ "1950 FIFA World Cup". FIFA.com. Fédération Internationale de Football Association. http://www.fifa.com/worldcup/archive/edition=7/teams/index.html। আহৰণ কৰা হৈছে: 15 August 2011. ↑ 48.0 48.1 FIFA considers that the national team of Russia succeeds the USSR, the national team of Serbia succeeds the Yugoslavia/Serbia and Montenegro, and the national team of Czech Republic succeeds the Czechoslovakia. ("Russia". FIFA.com. Fédération Internationale de Football Association. http://www.fifa.com/associations/association=rus/index.html. ; "Serbia". FIFA.com. Fédération Internationale de Football Association. http://www.fifa.com/associations/association=srb/index.html. ; "Czech Republic". FIFA.com. Fédération Internationale de Football Association. http://www.fifa.com/associations/association=cze/index.html. ). ↑ "Brazil". FIFA.com. Fédération Internationale de Football Association. http://www.fifa.com/associations/association=bra/index.html. ↑ "FIFA World Cup awards". FIFA.com. Fédération Internationale de Football Association. http://www.fifa.com/mm/document/fifafacts/mcwc/ip-301_03a_fwc-awards_22643.pdf। আহৰণ কৰা হৈছে: 5 March 2009. ↑ "Golden Ball for Zinedine Zidane". Soccerway. 10 July 2006. http://www.soccerway.com/news/2006/July/10/golden-ball-for-zinedine-zidane/। আহৰণ কৰা হৈছে: 31 December 2007. ↑ "adidas Golden Shoe – FIFA World Cup Final". FIFA.com. Fédération Internationale de Football Association. http://www.fifa.com/classicfootball/awards/golden/award=gsa/idcup=17/pastcupawards.html। আহৰণ কৰা হৈছে: 4 March 2009. ↑ "Kahn named top keeper". BBC Sport. 30 June 2002. http://news.bbc.co.uk/sport3/worldcup2002/hi/team_pages/germany/newsid_2075000/2075695.stm। আহৰণ কৰা হৈছে: 31 December 2007. ↑ 55.0 55.1 55.2 Pierrend, José Luis (18 May 2007). "FIFA Awards". rec.sport.soccer Statistics Foundation. http://www.rsssf.com/miscellaneous/fifa-awards.html। আহৰণ কৰা হৈছে: 8 January 2008. ↑ Yannis, Alex (10 November 1999). "Matthaus Is the Latest MetroStars Savior". New York Times. http://query.nytimes.com/gst/fullpage.html?res=9C00EFD8103AF933A25752C1A96F958260। আহৰণ কৰা হৈছে: 23 December 2007. ↑ "World Cup Hall of Fame: Lothar Matthaeus". CNN. http://sportsillustrated.cnn.com/soccer/world/2002/world_cup/hof/matthaeus/। আহৰণ কৰা হৈছে: 23 December 2007. ↑ Kirby, Gentry (5 July 2006). "Pele, King of Futbol". ESPN. http://sports.espn.go.com/espn/classic/bio/news/story?page=Pele। আহৰণ কৰা হৈছে: 23 December 2007. ↑ Chowdhury, Saj (27 June 2006). "Ronaldo's riposte". BBC Sport. http://news.bbc.co.uk/sport1/hi/football/world_cup_2006/teams/brazil/5112982.stm। আহৰণ কৰা হৈছে: 23 December 2007. ↑ "Goal machine was Just superb". BBC Sport. 4 April 2002. http://news.bbc.co.uk/sport3/worldcup2002/hi/team_pages/france/newsid_1752000/1752740.stm। আহৰণ কৰা হৈছে: 23 December 2007. ↑ Hughes, Rob (11 March 1998). "No Alternative to Victory for National Coach : 150 Million Brazilians Keep Heat on Zagalo". International Herald Tribune. Archived from the original on 26 February 2008. http://web.archive.org/web/20080226063509/http://www.iht.com/articles/1998/03/11/soccer.t_7.php। আহৰণ কৰা হৈছে: 31 December 2007. ↑ Brewin, John (21 December 2007). "World Cup Legends – Franz Beckenbauer". ESPNSoccernet.com (ESPN). http://soccernet.espn.go.com/archive/worldcup/editorial/legends_beckenbauer.html। আহৰণ কৰা হৈছে: 31 December 2007. ↑ "1938 France". CBC. Archived from the original on 18 June 2006. http://web.archive.org/web/20060618095935/http://www.cbc.ca/sports/worldcup2006/history/events/1938.html। আহৰণ কৰা হৈছে: 31 December 2007. ↑ "Germany move ahead of Brazil". FIFA.com. Fédération Internationale de Football Association. Archived from the original on 9 July 2010. http://web.archive.org/web/20100709063123/http://www.fifa.com/worldcup/news/newsid=1269182/index.html?। আহৰণ কৰা হৈছে: 6 July 2010. ↑ "Planet World Cup – All time table". Planet World Cup. http://www.planetworldcup.com/NATIONS/maraton.html। আহৰণ কৰা হৈছে: 26 January 2008. Glanville, Brian (2005). The Story of the World Cup. Faber. পৃষ্ঠা. 44. ISBN 0-571-22944-1.